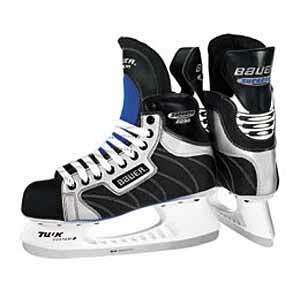 We often check Kijiji classified ads looking for used hockey equipment for sale. The Kawartha Komets are always in need of good, used equipment as our players outgrow their gear and need to replace it. Recently Carol resonded to a Kijiji ad for various pieces of equipment. While speaking to the woman who had placed the ad, our Special Needs Hockey Program was mentioned and the lady offered to donate the equipment "to such a good cause." What a kind and generous gesture! Today we picked up five (5) pairs of good skates, 2 sticks, some shoulder pads and elbow pads and a pair of hockey pants. Many thanks to Karen Searle and Bruce Parkinson for their generosity.